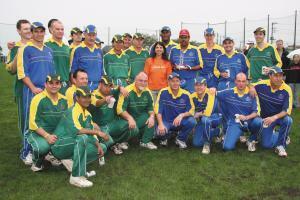 Cricket stars gather for leukemia fundraiser. Once there was the sweetest, smiley-est of toddlers–Tyler Ferris. There was just one problem. Tyler had a very aggressive and difficult-to-cure form of leukemia. In spite of nearly two years of treatment, including a bone marrow transplant, Tyler’s short life ended in June of 2005. His parents, Mark Ferris and I, Kim Forsythe, reeling from the unacceptable loss of our baby, took the only action we thought was acceptable to us, and created an NPO to provide support for kids and their families who face a similar experience. What seemed to us, the only possible action we created an NPO to support kids and their families going through what we had been through. With the blessing of Tyler’s doctor, Masaaki Kumagai (head of pediatric oncology/hematology at the National Center for Child Health and Development) and Tokyo Tocho, The Tyler Foundation was born. The Tyler Foundation. Cricket stars. ‘Build it and they will come’, it was said, so our next move was to bring it all together There are a group of cricket (and rugby!) legends: Kapil Dev, Mike Gatting, Ray Bright, Dion Nash, Joel Stransky, Tom O’Gorman, Clive Rice, Devon Malcom, Barry Richards and Pat Symcox and not to menton a LOT of help from friends spread across the world from Japan to South Africa, Sports Extravaganza 2006—a three-day fundraiser with a Celebrity Sports Dinner, Celebrity Golf Day and Celebrity Cricket Match—was born. The Tyler Foundation built it, and indeed at the end of September 2006, those ten sporting legends came! But Mark, as well as Anton McCloy, Rob McKenna, Mark McTamney, and Rob Quinlivan had the vision, creativity and passion to put together an event that brought in over double their original fundraising goal (over 25 million yet net), and raised the bar on what people in Tokyo will expect from a fundraiser forevermore! Over 360 people flocked to the Grand Hyatt for the Sports Dinner on September 29, 2006. With three celebrity panel discussion sessions, a putting contest, heads and tails game (known as ‘two-up’ in Australia), and live and silent (sealed bid) auctions run by professional MC and auctioneer Justin Sampson, the crowd was more than entertained throughout the evening. Although the 6am wake-up call for the celebs the following morning was a bit painful at first, the great weather put everyone in a good mood for a challenging day of golf at the Seve Ballesteros Golf Club on the Saturday. Finally, on Sunday, hundreds of guests braved the slightly dodgy weather for the Celebrity Cricket match at the Yokohama Country and Athletic Club. 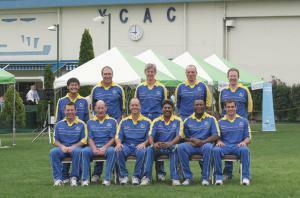 Teams led by Kapil Dev and Mike Gatting comprised of the celebrities as well as lucky local talent. 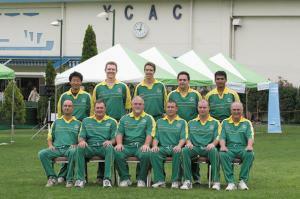 Kapil’s team won in the end, but it was a close match with Tim O’ Gorman’s century earning him man of the match. A guest appearance by Japan’s Miss Universe, Kurara Chibana, as well as games for kids and raffles, made for a great day in spite of a few raindrops. Three of the celebs went out to Tyler’s hospital to meet with Dr. Kumagai and tour the pediatric oncology ward to see for themselves just how the funds they were helping to raise would be used. While Tyler’s dad, Mark, was the mastermind behind the sports extravaganza, my job is to ensure the money raised is used in the most effective way. With a team of three doctors and nurses, as well as lots of input from mothers with children currently undergoing cancer treatment, I’m committed to make our dreams happen. The reason for staging such a large event for the Tyler Foundation’s first fundraiser was multi-fold. In addition to the obvious need to raise significant funds to get its programs moving, we wanted to create awareness about the foundation in Tokyo. The planning team thought that going a more traditional route (for example, a formal gala) for its first event wouldn’t have made such an impact. I am also director of charities for the Tokyo American Club Women’s Group, and so know that while people in Tokyo are looking for ways to give back to the local community, it’s actually hard to find volunteering opportunities. So the Tyler Foundation hopes to become a model for what a charity organization can be—not only providing a much needed support to children and families struggling through a heart-breaking challenge, but also giving people in the local community an opportunity to make a meaningful contribution. contact Kim Forsythe or Mark Ferris at kim@tylershineon.org or mark@tylerhsineon.org.